One of the more recent combinations of two favorite characters, The Shadow of the Bat concentrates on The Shadow in the Crossed Guns pose and has The Batman's shadow looming up on the wall behind. Originally the commission was to do a drawing based on the Shadow Bust Sculpture that Graphitti Designs produced some years ago (Designed by MwKaluta, sculpted by Randy Bowen). At the same time, the Bold Scotsman who owns this piece mentioned he'd been thinking also of a Batman commission. It was decided the Batman's shadow could easily appear in the background without an addition to the commission fee. As with most of these drawings presented on the commissions pages, the Wait Time between keen Idea and swell Finish tested the staying power of both the artist and the new owner! 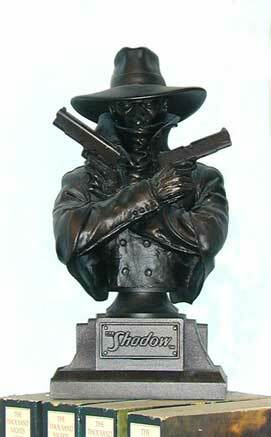 The Shadow character, copyrights, trademarks are owned by The Condé Nast Publications. Used with permission.